Growing catnip plants in container pots makes for a more controlled environment and keeps this member of the sometimes invasive mint family out of your garden, minimizing accidental damage to other desired plants. Known for its fragrant oil which has a hypnotic effect on cats, this plant is also considered a culinary herb and is commonly touted as medicinal herbal tea, according to the Maryland Cooperative Extension. Plant catnip in a container pot either as seedlings or by division. 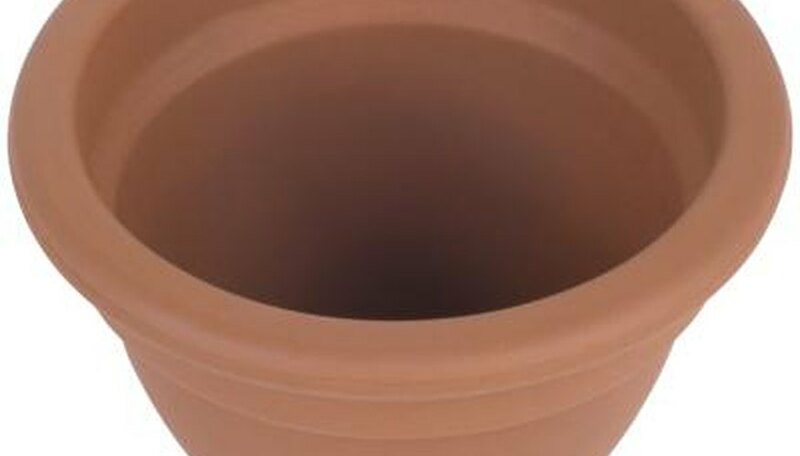 Use unglazed clay pots for this perennial herb. Space out seedlings based on their ultimate size of 3 feet in height. Plant in well-drained sandy loam or silt loam soil for best growth. Maintain a pH of 6.0 to 7.5 and keep soil as it is without amending to improve nutrients. Rich soil can inhibit optimal development as plants will grow too vigorously without producing much oil, according to the University of Minnesota Extension. Grow your catnip in areas that provide full sunlight for a minimum of 6 hours daily, though a full day of sun is best. Poor sun exposure results in weak, leggy plants. Mulch the entire area of soil covering your seeds and keep mulch surrounding your catnip as it grows if you place your pots outdoors. Lay a 2-inch layer of straw mulch to prevent weed growth and to keep soil moisture and temperature levels stable. Water your catnip when the soil is dry to the touch. Your potted catnip may need irrigation every day, so check the soil consistently. Irrigate plants with the goal of saturating soil but avoid soil that remains wet to avoid root rot, a common problem among herbs. Determine whether you want to keep your plants indoors or outdoors based on their temperature requirements. Keep catnip in temperatures that range from 68 to 86 degrees Fahrenheit, though it thrives below 80 degrees, according to the Maryland Cooperative Extension.